Lord Mayor Graham Quirk has unveiled a new design for the ‘green’ Victoria Bridge, converting it to three lanes on-road for Brisbane Metro vehicles and buses with a dedicated off-road cyclist and pedestrian path, following public consultation. The new bridge design to accommodate the Brisbane Metro project comes from feedback from the community and provides improved and safer facilities for cyclists and pedestrians, as well as a new on-road design for Council’s largest public transport project. “This new design for the Victoria Bridge will reconfigure the number of Metro and bus lanes from four to three, introducing a separated two-way cycleway on the upstream side of the bridge and cycle lanes on Melbourne Street. 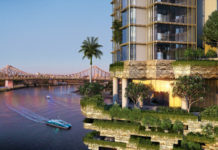 “The removal of general traffic from Victoria Bridge and the conversion into a ‘green’ bridge was always proposed as part of Brisbane Metro and feedback from the community supports this approach. “Council has listened carefully to the community and stakeholder feedback received on the Brisbane Metro Draft Design Report, with the redesign reflecting valuable input regarding cyclist and pedestrian access to the Victoria Bridge and Melbourne Street. 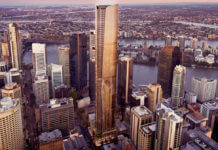 “Construction of Brisbane Metro is fully funded, with a $300 million investment from the Federal Government and construction will start next year with services to commence in 2023. Under the new design plan, West End peninsula Glider and other bus services would now ‘give way’ to Brisbane Metro vehicles which would receive priority non-stop travel through the busway system. 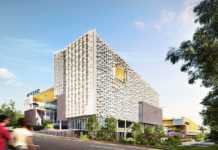 Deputy Mayor Adrian Schrinner said community feedback would continue to play a vital role in the $944 million project with further community consultation in South Brisbane, West End and the CBD, enabling residents, businesses and stakeholders to have their say on the project. “Council will undertake further community engagement on the changes to the Victoria Bridge and Melbourne Street pedestrian and cyclist access, and inner-city traffic network over the coming weeks. “Detailed analysis shows that the three-lane configuration will still provide more capacity for public transport, but will also deliver an improved outcome for people on bikes and on foot. It’s a win, win, win! “Brisbane Metro will reduce the number of buses entering the CBD and make the entire bus network operate more efficiently – that means more bus services in the suburbs. Cr Schrinner said Council was currently evaluating expressions of interest from five consortia to build the inner city infrastructure for the Metro before releasing a short-list to commence the tender proposal phase later this year with the final contract expected to be awarded by the end of next year. Federal Member for Brisbane Trevor Evans said the Brisbane Metro would deliver a high-frequency metro network across 21 kilometres of existing busway linking the Eight Mile Plains, Royal Brisbane and Women’s Hospital and University of Queensland Lakes busway stations and all stations in between. “With two metro lines operating every three minutes in peak periods, Brisbane Metro will deliver a network of turn-up-and-go services linking the suburbs with the inner city and fixing major bottlenecks in the inner city that cause daily congestion,” Mr Evans said. 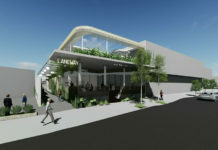 Detailed design and construction of the Brisbane Metro is scheduled to commence next year. The full draft design consultation outcomes report can be read here.